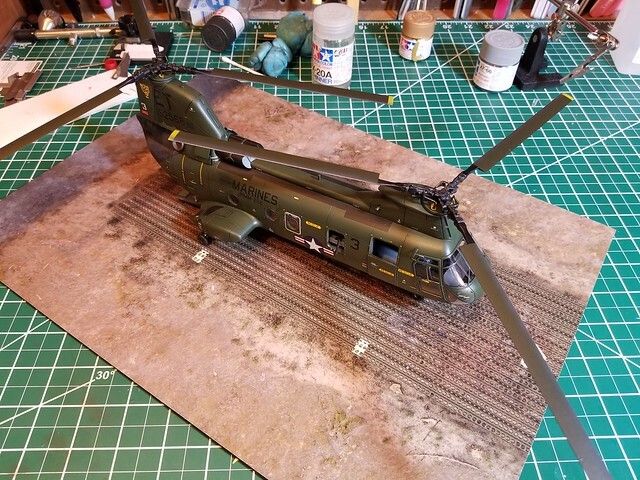 The decals may take a while. Wow, really impressive build so far. Love the interior details and experior paint. Looking forward to seeing it completed. Thank you Modeler#1. 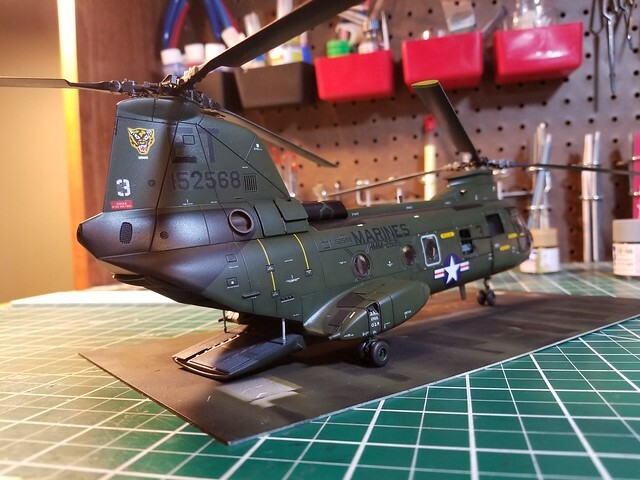 I'm going to be doing decals for a while. 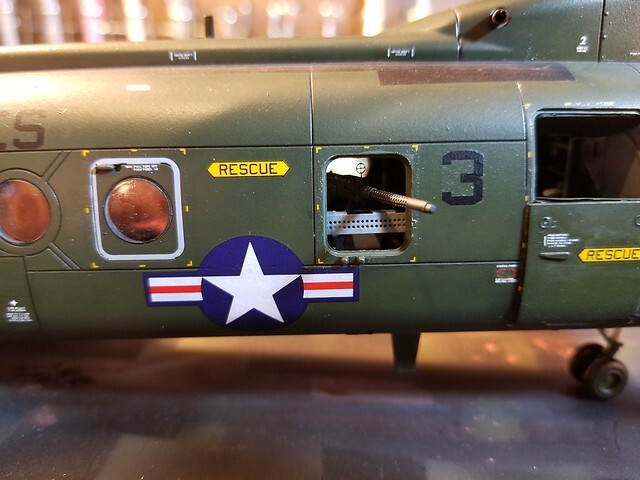 I'm just slowly adding decals. The left side stencils are done. The non-skid panels are applied. There's still alot left to apply. 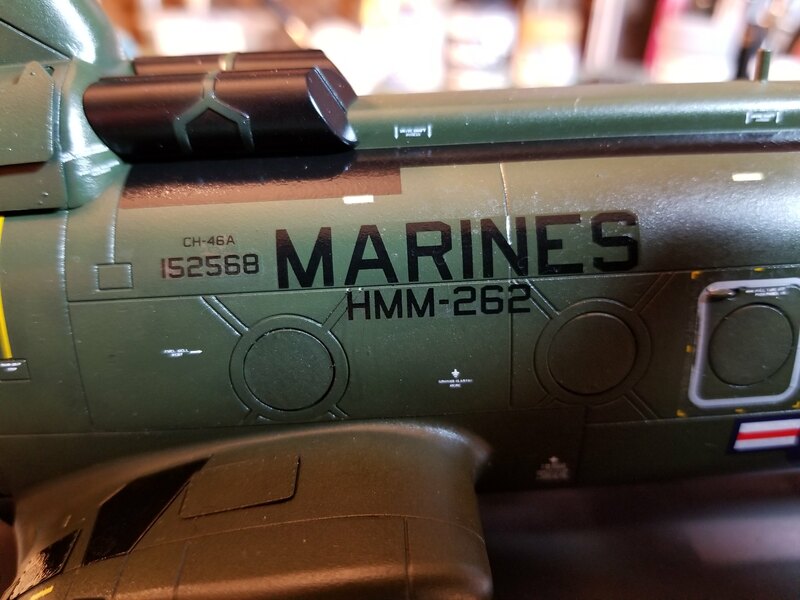 The stencils and service markings add a great deal of visual interest. It looks great with all those stencils! I applaud your effort. This build is really shaping up nicely. I thought I'd give an update. I'm done applying decals, but I think some of them will need more setting solution. Academy decals are OK, but they are a bit thick. They tend to need a few applications of Micro Sol along with some strategic slits from a blade. 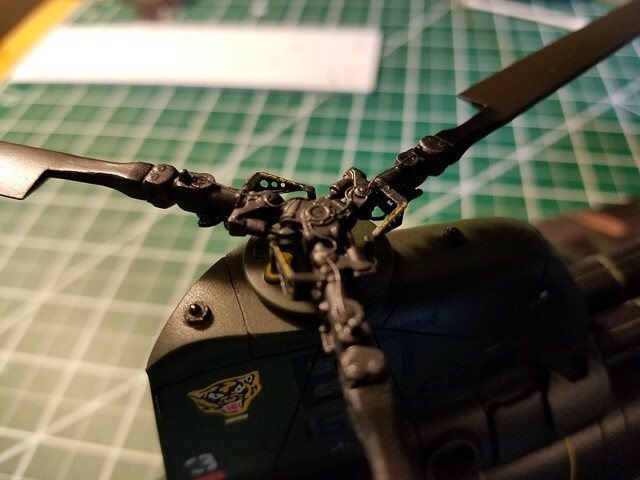 The decal placement instructions for this kit could use some improvement. 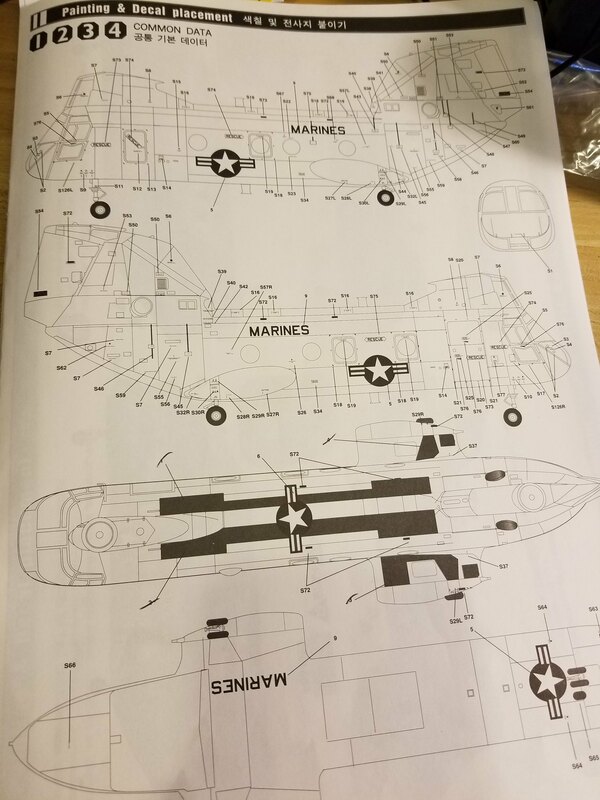 The general aircraft markings and stencil instructions are on page 9, and the specific aircraft marking instructions are on page 10. The panel lines on page 9 are inaccurate. Page 10 appears to be more accurate, but all of the little stencil decals aren't called out. Overall, I'm happy with my decals, but some of them will take some extra effort to lay flat without silvering. It may be some time before I show any progress. It's time for a vacation. It's time to call this one done. The decal battles lasted a very long time. I had to take a vacation from them. In the end, there was no working out the silvering. I'm quite happy with the model despite the silvered decals. If I were to build it again, I'd add some detail forward of the instrument panel. There's a little area that can be viewed through the front windscreen. The display base is from www.coastalkits.co.uk. I thought it was worth a try. 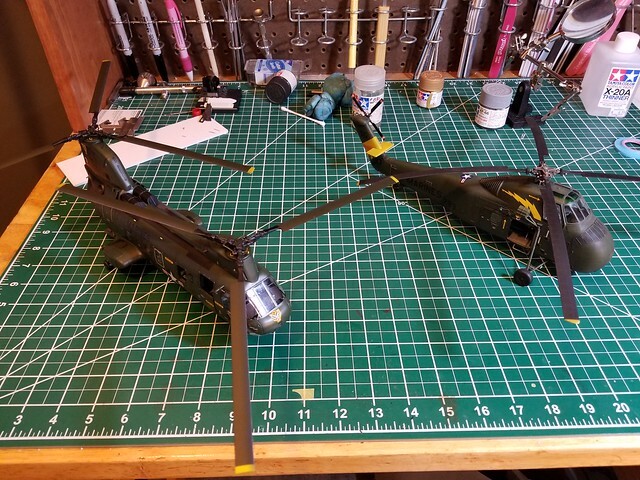 Marine medium helicopters of Vietnam. 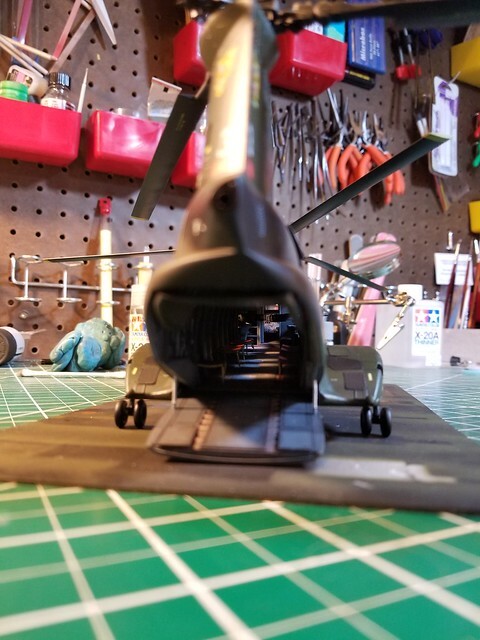 The Rotor-heads of my Marine Air Wing. We'll call it the 48th MAW. Turned out really nice! Nice collection you have going there of the big ones. 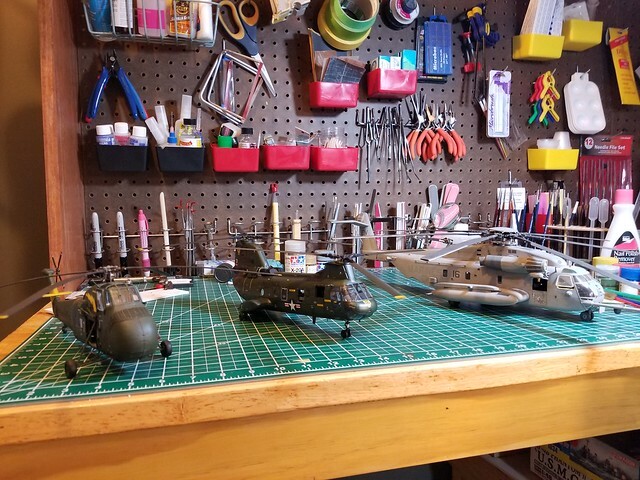 I have couple helo's in the stash. You're inspiring me to build one. Great job. 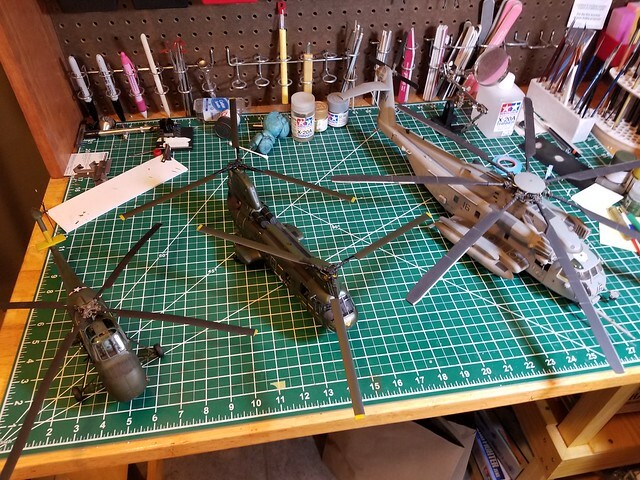 You should definately build the helos. They have a majestic look about them. It's like they have halo's. I think this will be my next project. 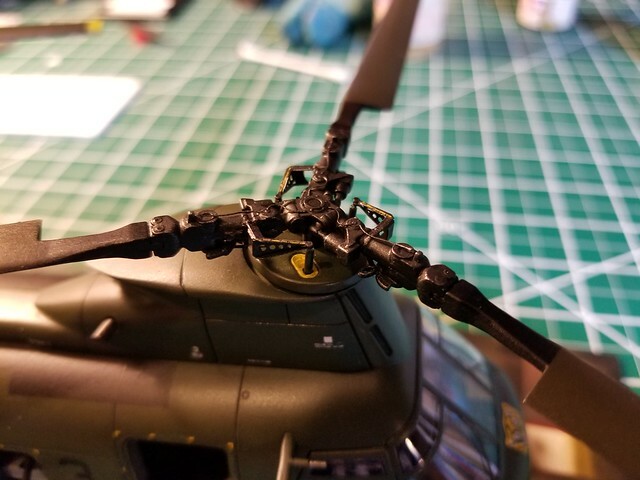 It's not a helo, but it keeps with the MAW theme. Well done. 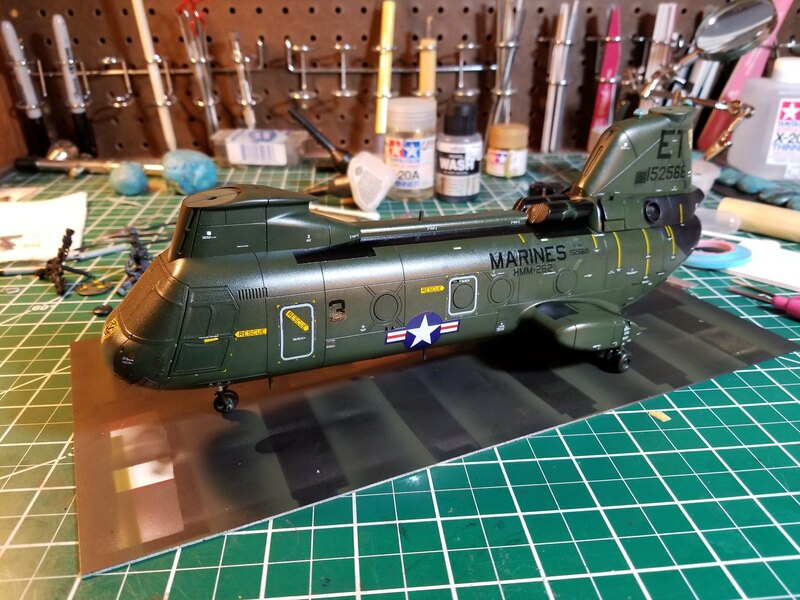 Did you apply the decals over flat or gloss? Great job on the 46! It looks outstanding with the back door dropped! And thanks for taking a comparison picture. I had no idea the 53 was that much bigger than a 46? Lee, Yes Sir, it had a couple of coats of future applied to it. It was a pretty smooth surface. I used Micro Set and Micro Sol, and I usually get very good results. 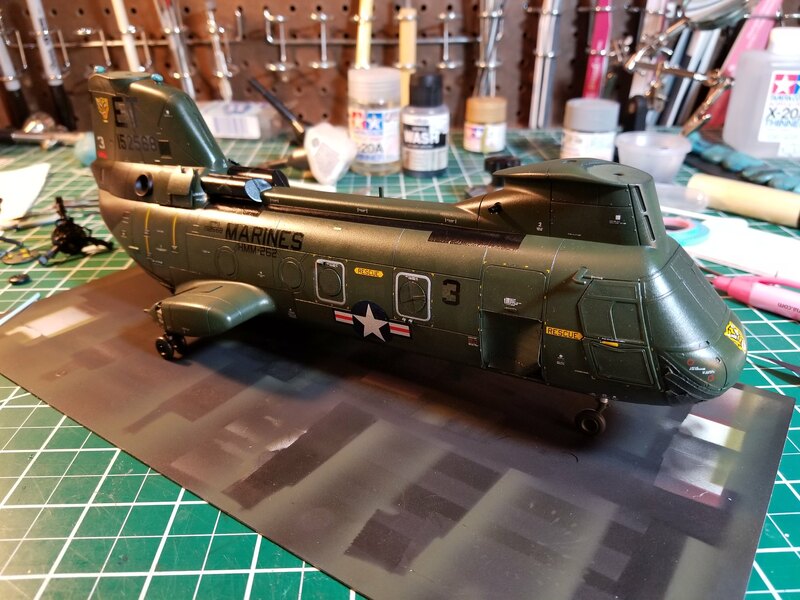 They were just thick and stubborn decals. I tried to get them settled down by poking holes in them at the points of silvering/bubbles, then adding more Micro Sol. 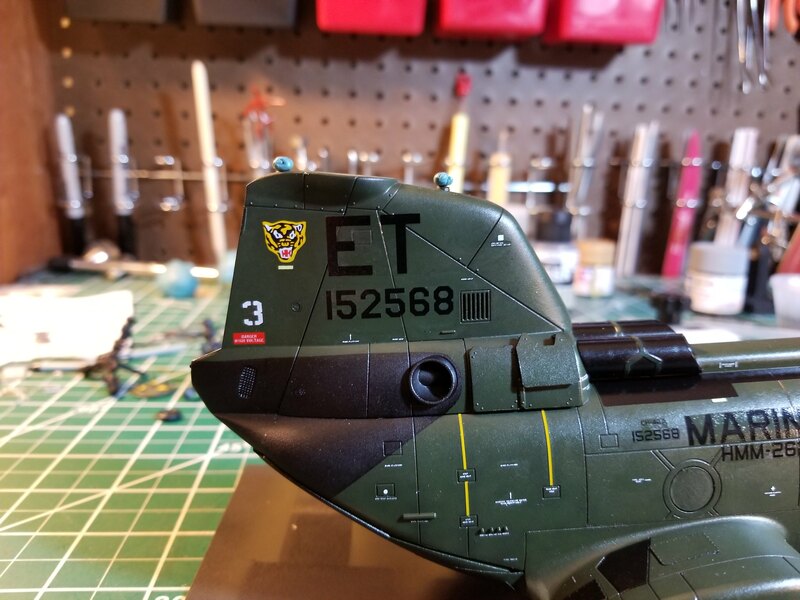 That method was starting to tear the decals. So I left it. I didn't want to get too aggressive. I decided at some point to give up the fight. They aren't too terrible, so I can live with them. Bruce, Yeah, the 53 is a big beast. 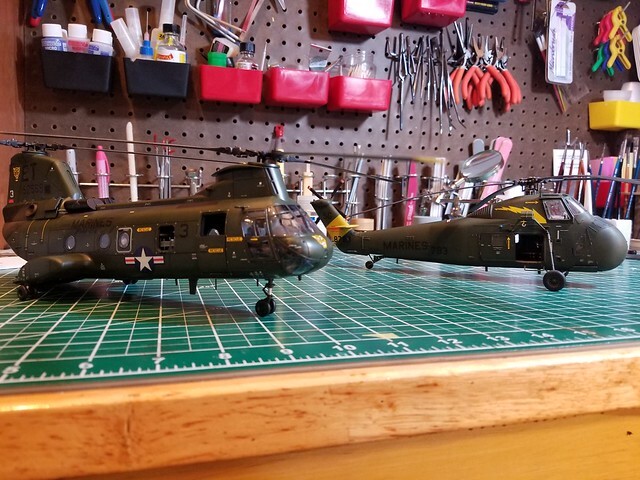 I was surprised to see that the fuselage of the UH-34 was about the same size as sthe 46. I know the capacity of the 46 is about twice that of the 34. That seems to be a function of layout and engine power. That is a good looking 46. It turned out great ! I fight Academy kits, but I like the way they look. Nice looking kit. If I may be so bold to offer a suggestion, try putting a puddle of Future down before placing the decal. I just did that for my A-36 in progress and the decals worked perfectly. I can give that a go! Honestly, I usually don't have problems with decals. I seem to struggle with Academy decals for some reason. I like Phrogs a lot . I have two in the stash . Maybe I'll get up off my duff and build one . I have that Big French bird to build first ! Excellent work Chris. 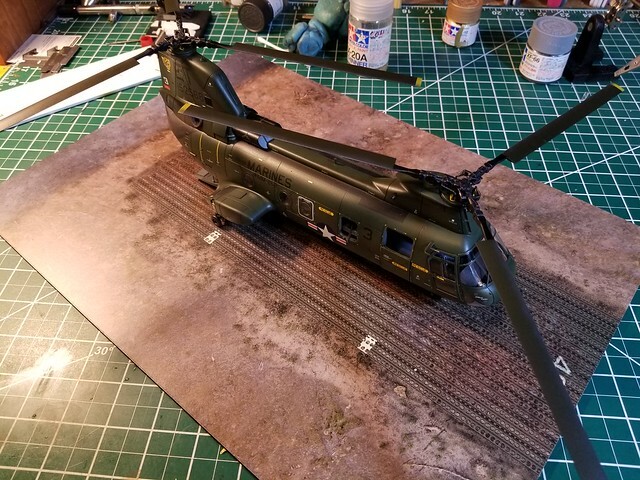 As a Marine veteran that has had the priviledge of riding in a CH-46, I want to say 'Thank you' for putting this Phrog together. Not just you, Academy decals are generally garbage unless they're Cartograf. 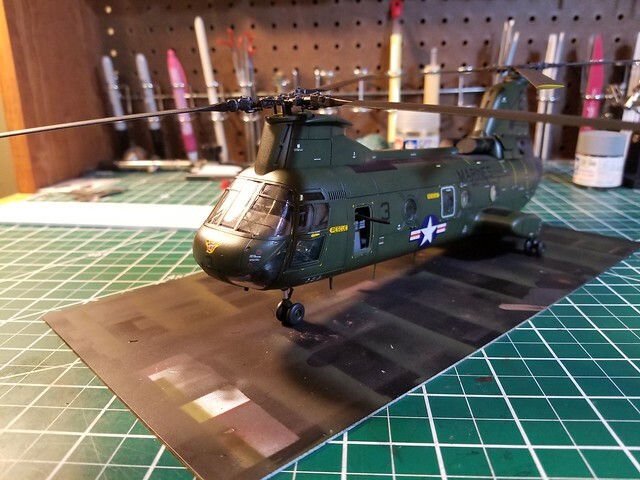 Anyway, great looking model and thanks for posting as it's helped me out with the color of the rotor blades. The black basing and paint marbling really add to the tonal variation just like the real thing. Sorry about the paint lifting, that's a bummer. 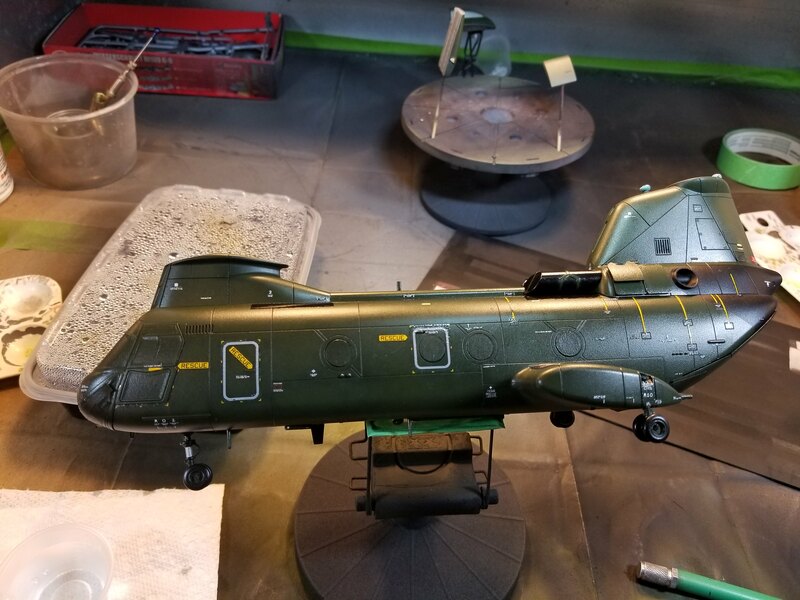 For that same issue I restrict my paint and primer selection to those strictly designed for modeling such as solvent based primers from Alclad, Tamiya, etc that will provide excellent bonding qualities. Sure they are more expensive but no unwanted surprises with them. Academy decals are notorious for issues but you did a great job with them. I recommend using Solvaset which is extra strong and does a heck of a job. You could use a new #11 blade and lightly score the silvered areas then apply the Solvaset. You'll be surprised how much silvering you can get rid off. 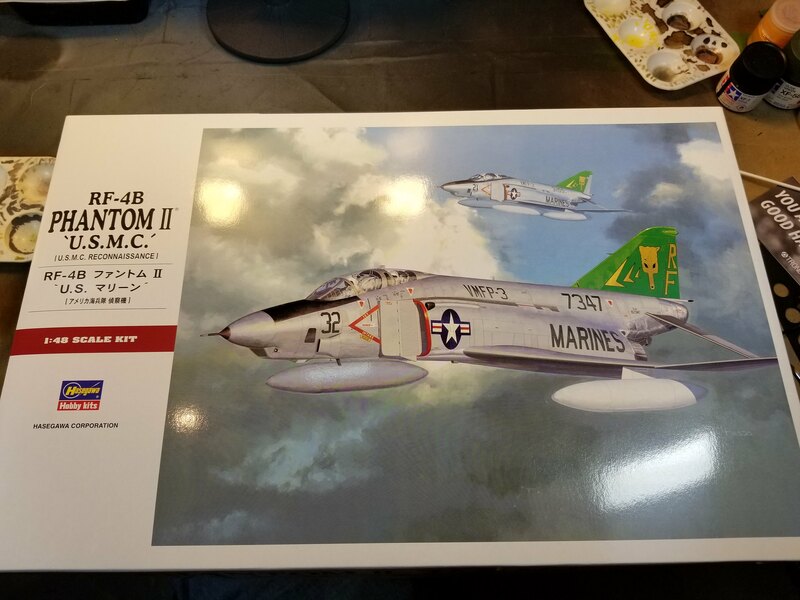 A friend bought a built 1/48 Tomcat on ebay in the black VX4 markings. 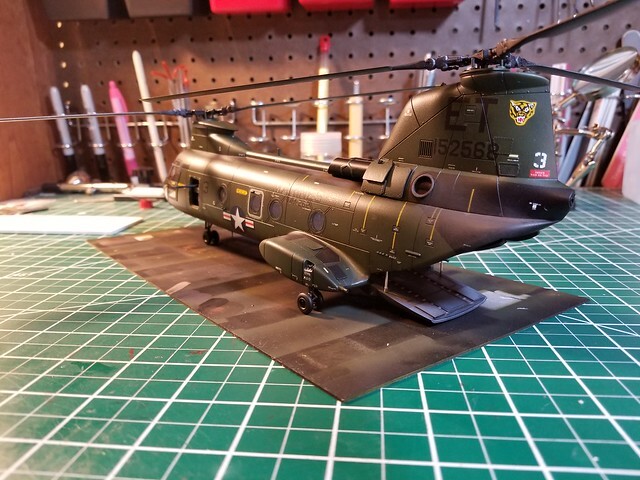 The build and paint were good but man the decals had tons of silvering and specially showed over the black paint. I used my method and got rid of at least 95% of the silvering. 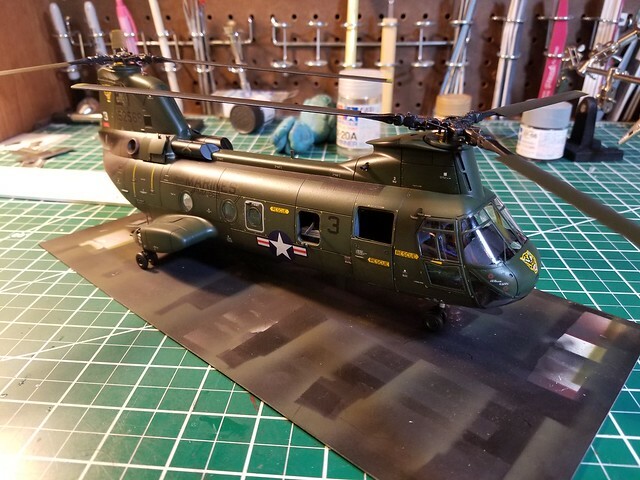 Your finished model looks fantastic so well done.